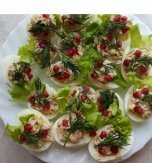 Let’s cook a delicious and healthy appetizer. If you want to have a light snack – then remember the recipe for this one. 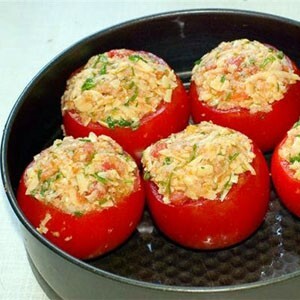 The egg stuffed tomatoes are a noncaloric and at the same time nourishing dish. Wash tomatoes and cut off the tops. 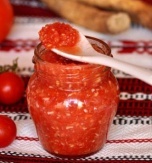 Remove all the pulp and seeds inside by the help of a spoon. Season the tomatoes with salt and pepper. 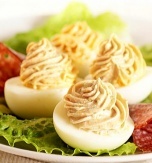 Boil eggs and peel them. Chop the eggs finely. Peel a carrot and grate it. Wash and chop parsley. Combine the ingredients together in a separate bowl. Add salt, oil, sugar, mustard, and vinegar. Mix everything carefully. 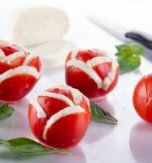 Stuff the tomatoes with the prepared filling and serve. 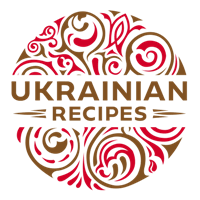 Do you have a favorite Ukrainian recipe for tomatoes stuffed with eggs and carrot? If so, please let us know in the comments below or write us an e-mail.